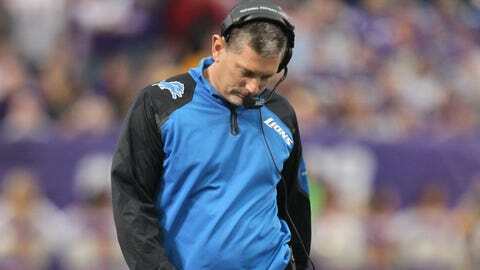 Coach Jim Schwartz was fired Monday after five seasons at the helm of the Detroit Lions. — In his third game as coach, Schwartz got his first victory, 19-14, over the Washington Redskins on September 27, 2009, breaking the club’s 19-game losing streak dating back to the final week of 2007. — Schwartz made a strong recruiting pitch to get free-agent defensive end Kyle Vanden Bosch to sign with the Lions in 2010. Schwartz, who had been Vanden Bosch’s defensive coordinator in Tennessee, visited KVB’s home to woo him. Vanden Bosch’s leadership and work ethic were a big part of the Lions’ transformation before the aging veteran was released after his third season in Detroit. — The Lions started to show tangible progress late in Schwartz’s second year when they won their final four games — vs. Green Bay, at Tampa Bay, at Miami and vs. Minnesota — to carry momentum into 2011. — The Lions started 5-0 two years ago for only the third time in franchise history and the first time since 1956. Nobody wanted to run Schwartz out of town at that point. — The turnaround hit a high point in Week 5 of the 2011 season when the Lions hosted Monday Night Football for the first time in a decade and handled the Chicago Bears, 24-13, to stay undefeated before a wild atmosphere at Ford Field. — With a chance to make the playoffs for the first time in 12 years, the Lions rose to the challenge on Christmas Eve in 2011 with a 38-10 victory over the San Diego Chargers to set off a big celebration at Ford Field. Schwartz had brought a playoff team to Detroit in just three years. — During the playoff run that season, the Lions were the king of comebacks. They became the first team in NFL history to rally from deficits of 13-or-more points to win four games in a season, the first to come back from 17-or-more points down to win three times, and also the first with comebacks of 20-plus points in back-to-back games. — Schwartz was the Lions’ first coach since Buddy Parker (1951-53) to improve the team’s record in each of his first three years. Schwartz inherited a 0-16 team and went 2-14 in 2009, 6-10 in 2010 and 10-6 in 2011. 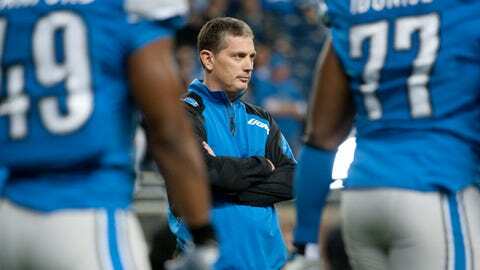 — Part of being coach of the Detroit Lions includes taking on numerous futility streaks. Schwartz couldn’t wipe them all out, but he did end a major one earlier this season by finally winning in Washington, D.C. after the franchise’s 21 consecutive road losses to the Redskins. — The Lions also ended a nine-year Thanksgiving Day losing streak last month with a 40-10 pummeling of the Green Bay Packers. At the time, it appeared Schwartz’s team was back on track to win the club’s first division title in 20 years and that his job would be safe. — Not much was expected in Schwartz’s first year but it was still a real letdown for the coach to go into Baltimore and get annihilated by the Ravens, 48-3, late in the season. What made it worse for Schwartz is that Baltimore is his hometown and he had a lot of family and friends there to watch his new team’s embarrassment. — Schwartz will be forever remembered for "The Handshake" with San Francisco 49ers coach Jim Harbaugh following the Niners’ victory in Detroit two years ago. Schwartz took exception to Harbaugh’s overly aggressive greeting. Schwartz then chased after Harbaugh, losing control of his emotions and nearly starting a brawl between the two sides. From that point on, Schwartz’s feistiness was viewed as a negative, not a positive. He even started to get criticized for flinging his headset to the ground after a big win. — One of the worst things you can say about a coach is that he has an undisciplined team. But that’s exactly what they’ve been saying about the Lions the last couple years now because of their excessive penalties along with numerous off-field problems in 2012. — With expectations growing coming off a playoff season, the Lions crumbled in the second half of the 2012 season, losing eight straight to finish 4-12. The most frustrating one probably came when Indianapolis rallied with two touchdowns in the final 2:39, including the winning score on a 14-yard pass as time expired. — Schwartz arguably cost the Lions a game on Thanksgiving in 2012 when he threw a challenge flag on a touchdown scored by the Houston Texans. Coaches are not allowed to challenge scoring plays because they’re automatically reviewed per league rules. When Schwartz threw the challenge flag illegally, the play no longer could be reviewed and the touchdown was allowed even though the Houston player should have been ruled down way back in Texans’ territory. The NFL later changed the rule so that a play could still be reviewed even if the coach made that same mistake. It’s become known as the Jim Schwartz Rule. — After starting 6-3 this season, the Lions collapsed in the second half again, losing six of their last seven games. Schwartz’s teams could never figure out how to finish games or seasons. They lost control of first place in the NFC North largely because of four late-season losses by a combined total of nine points. Over the last two years, they’re 2-14 in the second half of the season. — Whether you agree or disagree with the call, there’s no denying that the failed fake field goal at Pittsburgh in mid-November was a turning point this season. The Lions had a four-point lead in the fourth quarter while looking to improve their record to 7-3. The Steelers got momentum from making the stop and went on to win the game. Except for the Thanksgiving Day breakout, the Lions really weren’t the same team after Schwartz’s gamble backfired. He defended the decision with the now-infamous quote, "Don’t say I’m scared because we’re not." — More than any loss this year, the one that probably hurt the most was getting upset at home by the 2-8 Tampa Bay Buccaneers on November 24. It was the game that showed there was clearly something wrong with this team. — The final memory of Schwartz at Ford Field will be him turning around to yell at fans who were booing them for running out the clock at the end of regulation during the last home game. The Lions went on to lose in overtime to the New York Giants and were eliminated from playoff contention. Schwartz later conceded it probably would have been best for him to keep his thoughts to himself instead of reacting as he did. — In the end, Schwartz developed a reputation for being a little too cocky for someone who hadn’t experienced that much success. The joke about him was that he always thought he was the smartest person in the room even when he wasn’t. Fans turned on him. The media turned on him. It got ugly in the end, which is the main reason a change was necessary.